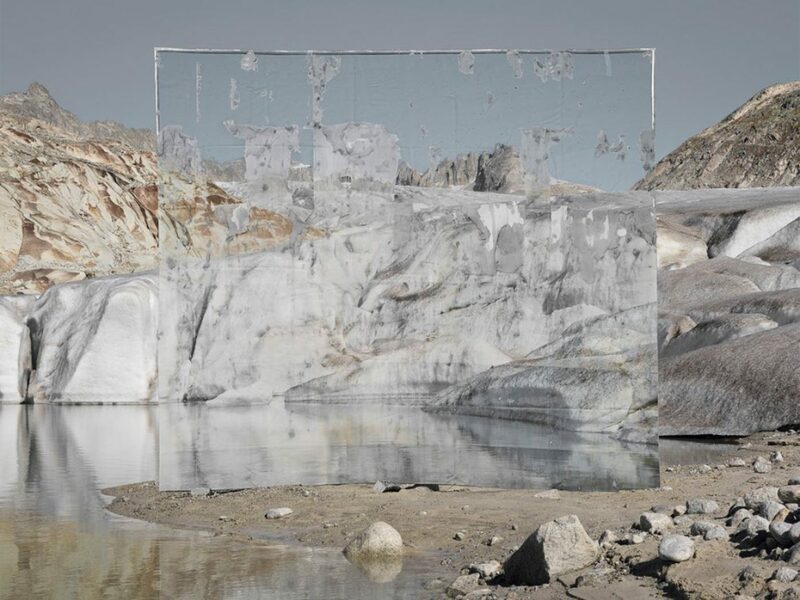 Following up on the previous post about our collaboration with the charity organisation, Project Pressure, we’re presenting the recap of the final artwork by French artist, Noémie Goudal. “The idea behind the installation questions how much you can use the landscape, then expect it to remain the same. If you damage a layer can it remain the same, will it rebuild?” explains Noémie on how to take action on climate changes. The artwork in particular is a photo of Glacier du Rhône itself. The paper used in the installation is printed on biodegradable, ecologically-safe paper that changes from being a normal sheet, a solid thing, to a white paste. The paper disintegrates in water and as the artwork dissolves, eventually the artificial landscape can be seen in its natural form. Noémie points out that it was important for both her and the team to use materials that don’t damage the landscape. “Over a short period, the paper falls off in layers, if not only links back to the earlier point of the stratum of the landscape, it also relates to a real timeline to do with climate change affects”. Read our original post to get a behind the scenes look into the process behind the making of the installation.